RNAi mediated inhibition of gene expression is a powerful method for identifying genes and their cognate phenotype, whose loss of expression alters the cell phenotype. The RNAi High-Throughput Screening (HTS) Facility provides automation and robotics support, guidance in screen assay development, implementation of primary and secondary screens as well as a human genomic siRNA library from Dharmacon-Horizon/Discovery. The HTS Facility is open for the UNC scientific community, free of charge, to perform cell based screens to define the contribution of each gene in the human genome to specific phenotypes. The facility supports essentially any cell based screen for siRNA analysis including reporter genes, GFP/CFP/RFP readouts, viability (example: mix and measure Cell TiterGlo Luminescent Cell Viability Assay), mitotic arrest, complex phenotypes measured by cell morphology, fluorescent markers, immunostaining, etc, and will work with investigators to perform all necessary assay optimization, validation and data analysis. access to information, protocols, data and software tools. In addition to the human genomic siRNA library composed of ~84,500 siRNAs targeting 21,125 genes in pooled format, the HTS Facility also has access to a 176 compound, small molecule inhibitor library targeting protein kinases and epigenetic modifiers in a 6×6 dose response matrices to screen for combination drug synergy. access to state-of-the-art instrumentation for high-throughput, high-content fluorescence imaging. assistance with arrayed CRISPR library screens by assisting with high throughput liquid handling for the production and delivery of sgRNA encoding lentivirus or transfection mixtures. Services provided by the facility include: Assay optimization and validation, high-throughput screening of human siRNAs, miRNA mimics and inhibitors or small molecule kinase and epigenetic inhibitors in a variety of cell lines, basic data analyses/hit selection, and support for follow-up validation assays. 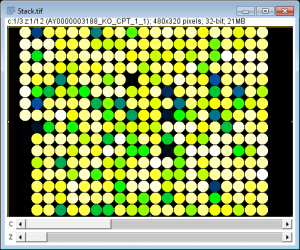 High-throughput drug screening is also available with drug libraries provided by the researcher, using a Beckman Biomek FX, fixed with a 96/384 channel pipettor, 8 channel SPAN-8 for cherry-picking and serial dilutions. Simple luminescence and fluorescence based assays can be read on our BMG Labtech PHERAstar FS, while complex cell phenotyping can be performed on our Thermo Cellomics Arrayscan.